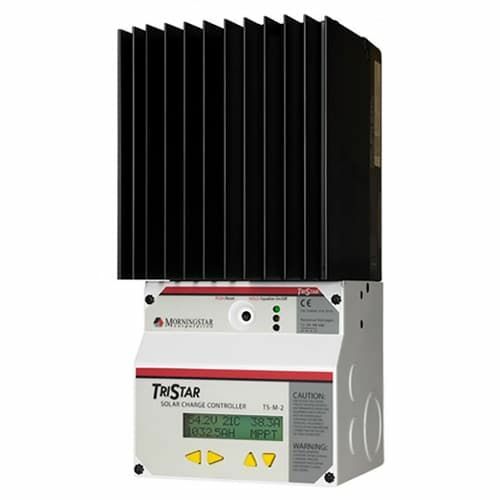 Morningstar's TriStar TS-MPPT-30, TS-MPPT-45, and TS-MPPT-60 solar charge controllers with TrakStar Technology are advanced maximum power point tracking (MPPT) controllers for photovoltaic (PV) systems up to 3 kW. These controllers work well in a variety of applications including: residential and commercial systems, remote telecommunications, 12 VDC RV & marine applications, traffic and highway telemetry, industrial automation & control, and solar outdoor lighting. The TS-MPPT controllers can be used with arrays having a maximum open-circuit voltage of 150 VDC and have a charging range of 8 to 72 VDC. The Morningstar TS-MPPT-60M comes with the digital meter display installed from the factory. Optional local and remote meters (see Morningstar Accessories) provide detailed operating data, alarms and faults with three LED indicators to display system status. The TS-MPPT has a simple DIP Switch setup for plug-and-play operation or is fully programmable with a PC connection. The chassis on the TriStar controllers is isolated from the power circuits, allowing use in both negative and positive grounded systems. Extensive Networking and Communications Capabilities enable system monitoring, data logging, and remote adjustments. All models offer open standard MODBUS protocol and Morningstar's MS View software and allow a Serial RS-232 connection to a PC or laptop. In addition, the TS-MPPT-60 includes a built-in Ethernet port for a fully web-enabled interface to view data from a web browser to display up to 200 days of data logging and send email/text and messages. The TS-MPPT-60 also has a built-in RS-485 port for connecting to an EIA-485 network. A remote temperature sensor (RTS) is included. See the Morningstar Accessories page for metering and other accessories for these controllers. Dimensions: 11.4"H x 5.1"W x 5.6"D. Weight: 9.2 lbs. Listed to UL 1741. 5-year warranty.